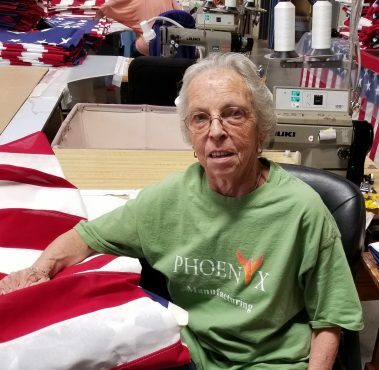 If the flag department is the heart of Phoenix’s manufacturing division, Wanda DuBoise is at the center of that heart. She was there when Phoenix boxed up its 1 millionth flag, working as an assistant to former lead worker Shirley Lanza. And she herself was leading the department when the 2 millionth flag was made. “I take a lot of pride in every stitch,” Wanda said. Wanda has been with Phoenix since 1995 but her professional sewing career started more than 40 years ago, shortly after she graduated from Butler High, class of 1971. She had grown up in the Merrimack Mill village. Her grandmother and mother taught her to sew, hoping that she also would join them in crocheting. Since sewing came much easier, Wanda was able to get a job after graduation working third shift at the Mill as a spinner, turning yarn into thread. From there, she worked at Doras Lee Drapery making drapes and bed spreads, and then at the H.D. Lee blue jean factory. After a while, she took a break from sewing and got a job at Shoney’s as a waitress. She stayed at the restaurant for about 11 years, working the breakfast and lunch shifts. Wanda left Shoney’s after her dad died to take care of her mom. About a year later, she saw an ad in the newspaper for a sewing machine operator at Phoenix. And 23 years later, she’s still here. Even though Wanda’s tenure at Phoenix has been a success, she admits that she was hesitant the previous supervisor. She recalls sharing with Phoenix VP Wes Tyler and Facility Security Officer Cynthia Brandon that these shoes might be too big to fill. Since the flag department hasn’t been late on a shipment in 23 years, it seems Wanda successfully took their advice to heart.